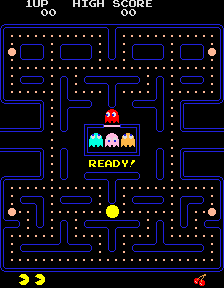 Home > NAMCO BANDAI Games America Inc.
Found one file extension association related to Pac-man and 1 file format developed specifically for use with Pac-man. Pac-Man is a arcade game developed by Namco and licensed for distribution in the U.S. by Midway, first released in Japan on May 22, 1980. Immensely popular in the United States from its original release to the present day, Pac-Man is universally considered as one of the classics of the medium, virtually synonymous with video games, and an icon of 1980s popular culture. Upon its release, the game became a social phenomenon that sold a bevy of merchandise and also inspired, among other things, an animated television series, and music. If you need more information please contact the developers of Pac-man (NAMCO BANDAI Games America Inc.), or check out their product website.